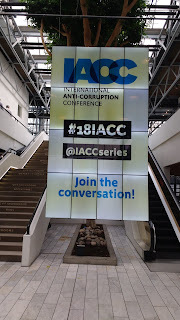 Many issues brought up at the 18th International Anti-Corruption Conference (IACC) in Copenhagen, Denmark, were relevant to the problems of conflicts of interest, crime and corruption in health care which we often discuss on Health Care Renewal, and hence bear repeating here. The discussion certainly got at the complexity of fighting corruption, seemingly one of many necessities that has come into light in the new political era. Unfortunately, while the complexity is fascinating, it suggests this fight will hardly be simple. Since warnings about corruption go back thousands of year, we already knew it would not be easily, if ever totally won. At the Opening Ceremony, Lars Lokke Rasumussen, the Prime Minister of Denmark, underlined the importance of journalists and activists holding leadership accountable. Yet the corrupt will tend to defend their interests by attacking such people. (Thus we have noted that corruption in health care, in particular, has long been a taboo topic, the anechoic effect.) Things can get very bad when a country is governed by the corrupt, and worse when these rulers are despotic. The hazards of being a whistle-blower, activist, and/or journalist holding the powerful accountable were emphasized by Huguette Labelle, Chair, International Anti-Corruption Conference Council, in that same session, who remembered those who have lost their lives for doing so. Also at that session, Delia Matilde Ferreira Rubio, Transparency International Chair, warned that despots may hijack the narrative, turning watchdogs into their lapdogs, and into attack dogs against their political opponents. On the other hand, watchdogs who refuse to cooperate may be punished or killed. At the Day 2 Plenary 3 Session on Exposing the Corrupt, Knocking Out Impunity, Barbara Trionfi, Executive Director, International Press Institute, noted that deception, propaganda, and disinformation may be used to mobilize attacks against whistle-blowers and real journalists, perhaps government responses to such attacks might help, at least if the government has not been totally captured. At the Day 3 workshop on Is the American Anti-Corruption Model Broken, Frank Vogl, Advisory Council Member, Transparency International, noted that there are now daily threats in the US to the free press, while the opposition party is assailed as a “mob.” Moreover, the US government institutions, such as the Department of Justice and the FBI, that often used to protect the free press, among others, from threats of violence, are themselves under constant attack from the top of the administration. At the Day 2 Fight Against Corruption as a Threat to Democracy workshop, one participant suggested that fighting corruption at best requires stable, functional specific anti-corruption institutions. While some countries have such institutions at the national level, the US does not. So at the Day 3 workshop on Is the American Model of Anti-Corruption Broken, Harvard Univeristy Professor Matthew Stephenson noted that the current US susceptibility to corruption may be partly due to the country's history of relying on norms rather than laws to address corruption. The Trump administration has set itself up as a norm violator, with so far little pushback. Furthermore, people subject to corruption may tend to go down extremist pathways, as noted at the "Post-Truth" workshop by Sarah Chayes, former Senior Fellow at the Carnegie Endowment for Peace. At that workshop, Nora Gilbert, Director of Strategic Projects and Partnerships, Represent.US, asked whether populist anti-corruption rhetoric, e.g., about “unrigging the system,” could be leveraged without going down the authoritarian pathway? If not, corruption may generate despotism, which in turn generates more corruption, a positive feedback cycle. The concern about how emphasis on fighting corruption could have the unintended effect of boosting authoritarian or despotic rulers was the subject of the Fight Against Corruption as a Threat to Democracy workshop. The audience was asked not to attribute quotes to participants, but I noted the following sorts of observations. The war on corruption can be seen as a war on politicians, parties, and institutions, and so can increase cynicism while risking pulling the whole system down. Even so, since strong supporters of certain politicians tend to disbelieve any negativity about them, including corruption allegations, such a war can leave the most corrupt offenders standing. Yet corruption is itself a huge threat to a reasonable democratic political system, because it robs people of votes, free speech, and the rule of law. Corrupt politicians do not shrink from protecting themselves by attacking votes, speech, and legal actions that threaten them. At the Fight Against Corruption as a Threat to Democracy workshop, Sarah Chayes noted that now in the US and many other places, corruption is now systemic, the standard operating system of trans-national kleptocratic networks. 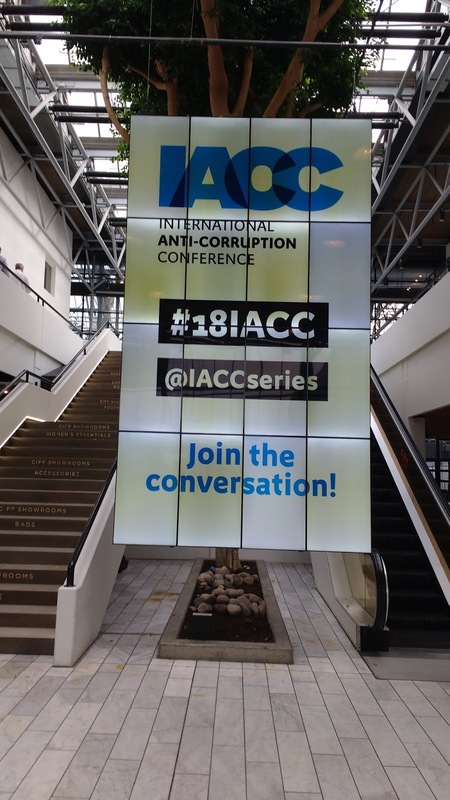 At an IACC a decade ago, embedded networks of influence were shown to be vehicles of corruption. They have apparently gone global. They may use extreme measures to preserve their power. One they have become especially good at is exploiting identity divides. At the Day 2 Plenary Session, Breaking the Global Corruption Web, Sarah Chayes further discussed how the networks were enabled in an era of predatory capitalism in which everything has its price. The networks' work is facilitated by finance firms, shell corporations, and reputation and money launderers. Rajiv Joshi, Managing Director, the B Team, noted that the Lewis Powell memo of 1972 provided the blueprint, by showing how big US corporations to use their public relations/ propaganda resources to capture the US government. Claudia Escobar, former Magistrate of the Court of Appeals of Guatemala, stated that the networks intertwine private companies, government, and organized crime. (Note that we have discussed some of the links between organized crime and the current US administration.) The melding of these entities was further emphasized by Monique Villa, Executive Director, Thompson Reuters Foundation, who urged us to always follow the money: asking again and again, cui bono? Who benefits? Corruption is enabled by deception, propaganda, and disinformation. A participant at the Fight Against Corruption as a Threat to Democracy workshop noted that traditionally democratic systems seem to depend on the idea that lies are easily counteracted. In an era of public relations, propaganda, and disinformation, lies are the currency. This was underlined by Kumi Naidoo, Secretary-General Designate, Amnesty International, speaking at the Breaking the Global Corruption Web plenary. He accused some parts of the global media, plus social media technology corporations, of complicity with the global kleptocratic network. He suggested that in the US, the in your face corruption of the Trump administration is enabled by the large minority of Americans who only believe what they see on extreme right-wing media and social media. Yet as Thomas Hughes, Executive Director, Article 19, pointed out in the Day 2 Plenary, Exposing the Corrupt, Knocking Out Impunity, the way to attack deception, propaganda, and disinformation may not be government regulation which risks censorship, especially if the government is corrupt, much less despotic. Will Fitzgibbon, Reporter, International Consortium of Investigatve Journalist, suggested it would be better to form alliances, preferably international, of journalists and whistle-blowers, like the group that published the Panama Papers. I would submit that the issues brought up at the conference suggested three themes, all disturbing. First, corruption has become increasingly systemic and global. The embedded networks of influence, which seemed to be national pheonomena a decade ago, are now global and supercharged, encompassing government, the private sector, and organized crime. Thus they can be termed global kleptocratic networks. Here in the US, it is most disturbing that the country seems to be governed by one such network. Our president and his family continues to run the Trump Organization, a global, albeit mysterious set of businesses which has had documented links to both domestic US and overseas organized crime (look here). As corruption increases, wouldbe and actual despots increase their populist appeal by claiming to be anti-corruption (in the US, we heard "drain the swamp.") Yet despotic regimes often foster even more corruption, but then might blame it on others, while continuing to proclaim their drainage skills. Shady business practices and shady politics have long been enabled by public relations (which Bernays thought sounded better than "propaganda") and the disinformation campaigns that grew from it. Now this has been further ramped up by social media. The good news is that the problems of corruption and crime in health care can now be more easily seen as just part of larger problems. The bad news is that this has only come into view as the problems of US and global corruption become profound. Furthermore, as we think about more corruption, the issue seems much more complex. At least conferences like the 18th IACC provided a venue to being to address the complexity before we are totally overwhelmed. NOTE (Oct 29, 2018) - Discussion section revised and enlarged to include the three themes above. When health care corruption is discussed in English speaking developed countries, it is almost always in terms of a problem that affects some other places, mainly presumably benighted less developed countries. At best, the corruption in developed countries that gets discussed is at low levels. In the US, frequent examples are the "pill mills" and various cheating of government and private insurance programs by practitioners and patients. Lately these have gotten even more attention as they are decried as a cause of the narcotics (opioids) crisis (e.g., look here). In contrast, the US government has been less inclined to address the activities of the leaders of the pharmaceutical companies who have pushed legal narcotics (e.g., see this post). We have been posting about this for years at Health Care Renewal, while seeing little progress on this issue. For example, we had long complained that US law enforcement had not been devoting enough effort going after the corruption of the leadership of large health care organizations, thus effectively allowing these leaders' impunity. However, in the later years of the Obama administration the US Department of Justice during the Obama administration made some modest attempts to decrease such impunity, including the formation of a Health Care Corporate Strike Force. the strike force was created in the fall of 2015, with five dedicated lawyers working on about a dozen of the most complex corporate fraud cases in the health care space. Andrew Weissmann, the then-chief of the DOJ’s fraud section, told a health care conference in April 2016 that the section was placing 'a heightened emphasis' on corporate health care fraud investigations. He pointed to the recently established Corporate Fraud Strike Force that he said would focus resources in investigation and prosecution of larger corporate health care law violations, as opposed to smaller groups or individuals. This little bit of progress was not to last. Unfortunately, that strike force was downsized by the Trump administration as we noted in July, 2017. Then as we noted in May, 2018, even the previously modest efforts by the US government to challenge corrupt acts by large US health care organizations were decreasing. By that date, we found only one significant settlement made during the year. That month, a report by Bloomberg, appeared with the headline, "White-Collar Prosecutions Fall to 20-Year Low Under Trump," on May 25, 2018. Meanwhile, the Trump administration itself increasingly appeared corrupt. In January, 2018, we first raised the question about how health care corruption could be pursued under a corrupt regime. We noted sources that summarized Trump's. the Trump family's, and the Trump administration's corruption.. These included a website, entitled "Tracking Trump's Conflicts of Interest" published by the Sunlight Foundation, and two articles published in the Washington Monthly in January, 2018. "Commander-in-Thief," categorized Mr Trump's conflicted and corrupt behavior. A Year in Trump Corruption," was a catalog of the most salient cases in these categories in 2017. 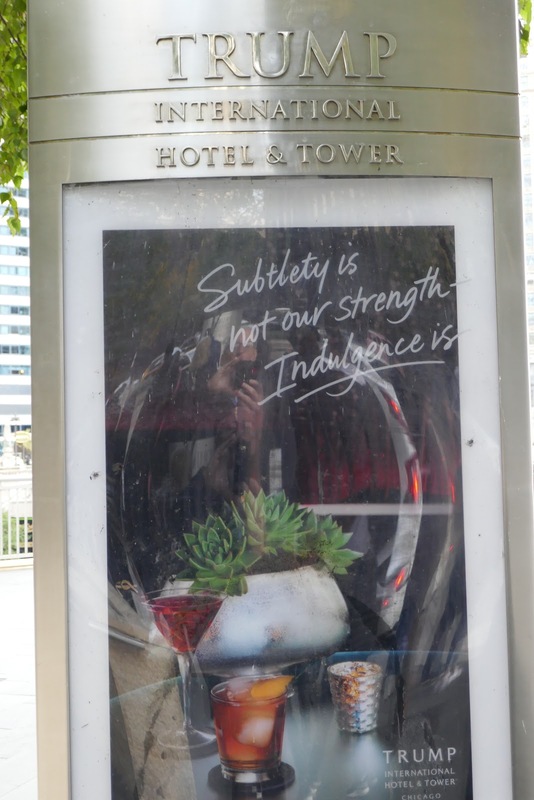 Poster displayed in front of Trump International Chicago Hotel, displaying the slogan: "Subtlety is not our strength. 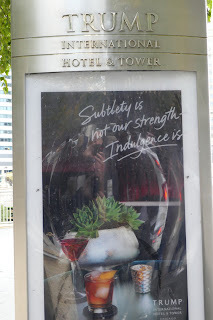 Indulgence is." So let me try to summarize the main points of Trump's indulgence, keyed to the four sections of the report. One of the most direct ways that President Trump can profit from the presidency is by making decisions that effectively require U.S. government agencies to purchase goods or services from the Trump Organization. Though unseemly and costly to taxpayers, this is one of the less destructive forms of potential profiteering by President Trump, since it does not significantly distort U.S. policy. 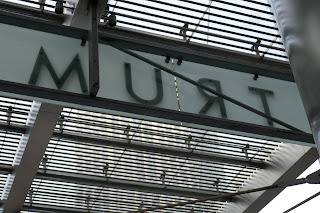 Examples included the Secret Service and Department of Defense renting expensive space in Trump Tower in New York; the Secret Service paying the Trump Organization in order to protect President Trump during the many occaisions (208 days at that point) he has spent at Trump Organization luxury properties; payments to the Trump Organization for Secret Service and other government staff presence at overseas Trump properties when visited by the President on ostensibly government business; and payments to the Trump Organization when Trump and his family fly on his private planes for non-government business. This has been called the "domestic emoluments clause," and is supposed to prohibit a kind of conflict of interest, that is, a President getting paid by some part of the US government, or by state governments separate from his regular salary and benefits. Nonetheless, Trump has been effectively paid, again and again, through the Trump Organization by the US government. Donald Trump and his family can also enrich themselves by taking advantage of the unique status and exposure of the President of the United States to promote Trump family brands. While distasteful, this brand-promotion activity is also one of the less harmful ways in which the Trump Administration may seek to profit from the Presidency, as it does not involve significant distortions of U.S. policy. Nonetheless, the overt attempts to use the presidency as a marketing opportunity indicate a troubling underlying attitude. Examples included the White House website promoting Melania Trump's jewelry line; WH senior advisor KellyAnne Conway, speaking in the Briefing Room, endorsing Ivanka Trump's fashion line; various activities that served to promote Trump Organization luxury properties, particularly Mar-a-Lago and Bedminster; promotion of Ivanka Trump's fashion line via her official participation in a World Bank Women Entrepreneurs Finance Initiative; the Voice of America and State Department promoting Ivanka Trump's book; the Trump Organization's apparently illegal use of the Presidential Seal to promote golf products; Trump Organization's discount promotion of golf merchandise to WH staff; and Trump Campaign and Republican National Committee events at Trump properties. The extent of the Trump Organization’s business interests makes it impossible to summarize all of the potential conflicts of interest that might arise. For example, the Trump Organization has been involved in labor disputes; Trump businesses regularly apply for visas for foreign workers (see here, here, and here); and Trump businesses are subject to countless federal safety and environmental regulations. (See here for an in-depth analysis of many of these potential conflicts.) As head of the executive branch, President Trump might have influence over numerous decisions that affect the Trump Organization’s business interests. 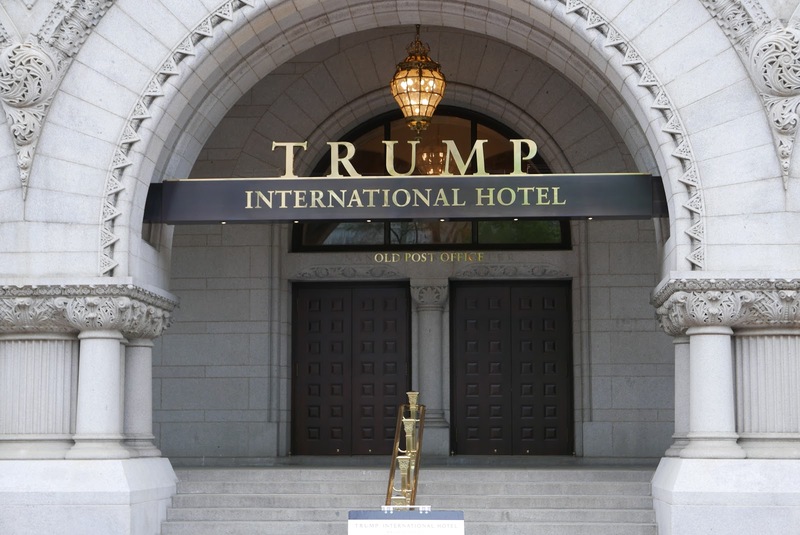 Some of the examples provided were government actions that affected the Housing and Urban Development (HUD) subsidies being received by Trump Organization properties; the Dakota Access Pipeline, which was being built by a company in which Trump owned stock; the Clean Water Act, whose rollback would benefit Trump Organization golf courses; the General Services Administration lease held by the Trump Organization to operate the Trump International Hotel in Washington, DC; the decision to demolish the current FBI headquarters, possibly allowing a competitor to the Trump International Hotel in Washington to be built across the street; various business interests of Ivanka Trump and her husband; the proposed infrastructure project which could variously affect the Trump Organization; the Justice Department investigation of Deutsche Bank, a large source of loans to Trump and his family; offshore oil drilling which could affect the attractiveness of Trump properties like Mar-a-Lago; Fannie Mae and Freddie Mac, controlled by the government, but whose investors include a large hedge fund in which Trump has a stake; the travel ban so as not to affect countries in which the Trump Organization has operations; H2B visa applications which supply workers to Trump properties; the tax reform plan which greatly affected Trump's taxes; and the choice of US Attorneys in jurisdictions in which the Trump Organization operates and whose offices may be in a position to investigate Trump, the Trump Organization, and Trump associates. Another significant concern is that individuals, private firms, and foreign governments may believe—rightly or wrongly—that they can curry favor with the Administration and increase their odds of favorable policy decisions by engaging in private business transactions with companies owned by or connected to President Trump—or, in the case of foreign governments, granting favorable regulatory treatment to Trump business operations in their countries. This is one of the most serious concerns related to the Trump family’s interest in profiting from the presidency, as it gives rise both to the appearance of corruption and the risk of actual corruption. 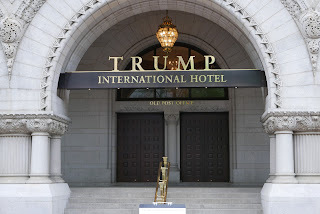 - Bookings made at the Trump International Hotel in Washington DC by foreign governments including Bahrain, Saudi Arabia, Kuwait, Turkey, Malaysia, the Phillipines, and Afghanistan. - Events at other Trump properties, the renting and purchasing of Trump properties, Trump Organization developments in countries including Indonesia, India, Panama, Turkey, United Arab Emirates, Scotland, Dominican Republic, and Taiwan. - Trump Organization seeking trademarks in China. This again is supposed to prohibit a species of conflict of interest, any payment to a US government official, including the President, by a foreign government, without the express consent of the US Congress. There are several lawsuits in progress on this matter, but no action has been taken by the Trump regime, or its supporters in Congress, to curtail these foreign emoluments. In addition, the Trump Organization has had dealings with US state governments that may violate the domestic emoluments clause of the US constitution. These included tax breaks recently given to new Trump hospitality properties by the state of Mississippi. The scope of conflicts of interest and corruption affecting US President Donald Trump, his vast business empire, his family and associates seems incomprehensively big. And still, corruption remains a nearly taboo topic. In November, 2017, we noted that once again, a report by Transparency International that showed that in an international survey of corruption perceptions, substantial minorities of US respondents thought that US corruption was increasing, and was a particular affliction of the executive and legislative branches of the national government, other government officials, and top business executives. There was virtually no coverage of these results in the US media, just as there was virtually no coverage of a 2013 survey that showed 43% of US respondents believed that US health care was corrupt. Similarly, the reports about Trump related corruption listed above have generated little discussion. Despite the extensive and ever-increasing list of apparently corrupt acts by the Trump and cronies, grand corruption at the top of US government, with its potential to corrupt not just health care, but the entire country and society, still seems like a taboo topic. The US news media continues to tip-toe around the topic of corruption, in health care, of top health care leaders, and in government, including the top of the US executive branch. As long as such discussion seems taboo, how can we ever address, much less reduce the scourge of corruption? The first step against health care corruption is to be able to say or write the words, health care corruption. But even if we can take that step, when the fish is rotting from the head, it makes little sense to try to clean up minor problems halfway towards the tail. Why would a corrupt regime led by a president who is actively benefiting from corruption act to reduce corruption? The only way we can now address health care corruption is to excise the corruption at the heart of our government. New York Times Remembers Dr Bernard Carroll, the "Conscience of Psychiatry"
We at Health Care Renewal miss Dr Bernard Carroll, who we were proud to count among our bloggers. The New York Times just published a kind obituary, which called him "the conscience of psychiatry." Dr. Bernard J. Carroll, whose studies of severe depression gave psychiatry the closest thing it has to a 'blood test' for a mental disorder, and who later became one of the field’s most relentless critics, helping to expose pervasive corruption in academic research, died on Sept. 10 at his home in Carmel, Calif. He was 77. He and a lifelong friend, Dr. Robert Rubin, a professor of psychiatry at the University of California, Los Angeles, dissected psychiatric studies as they appeared, flagging sloppy work and sniffing out conflicts of interest. They then broadcast their findings to former colleagues and allies through various email lists, often taking their findings to the news media. In the 2000s, Dr. Carroll and Dr. Rubin worked with Paul Thacker, then a staffer for Senator Charles Grassley of Iowa, to help expose huge undeclared payments to top academic researchers at Harvard, Emory University and other institutions. He knew very well how this world operates; he had consulted widely with drug makers himself. 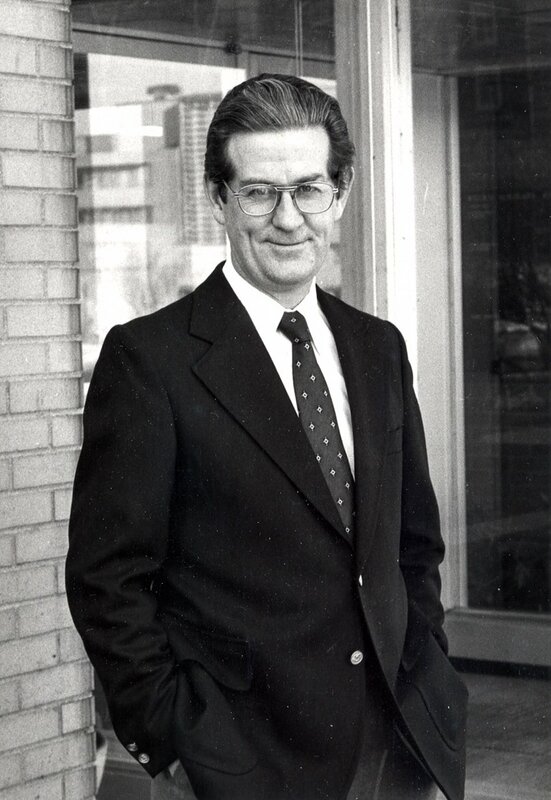 Dr. Carroll’s work ethic and vast connections helped convert many younger researchers to his cause; they now view the published psychiatric science with his skeptical eye. The medical guys playing scampers. Once grant funds are safe in their clampers. 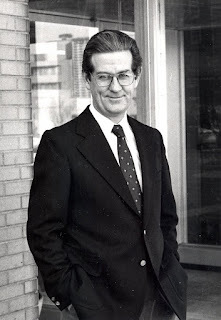 Dr Carroll was was with us at Health Care Renewal since 2005, contributing insightful, pithy, provocative and important posts. He also authored some of our most widely read posts. Most viewed was: JAMA Jumps the Shark. His most recent post was Corruption of Clinical Trials Report: A Proposal. All his posts can be found here. We all miss him.